St. Maximilian Kolbe, O.F.M. Conv. Against drog addictions, drog addicts, faimilies, imprisoned fowk, jurnalists, poleetical prisoners, prisoners, pro-life muivement, amateur radio. 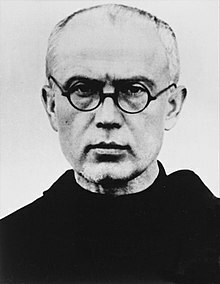 Saunt Maximilian Maria Kolbe, O.F.M. Conv. (Pols: Maksymilian Maria Kolbe [maksɨˌmʲilʲjan ˌmarʲja ˈkɔlbɛ]; 8 Januar 1894 – 14 August 1941) wis a Pols Conventual Franciscan friar, who volunteered tae die in place o a stranger in the German daith camp o Auschwitz, locatit in German-occupied Poland during Warld War II. ↑ "Biographical Data Summary". Consecration Militia of the Immaculata. Archived frae the oreeginal on 2 January 2014. Retrieved 10 October 2012. This page wis last eeditit on 5 October 2018, at 04:38.